It’s been two years since J.K. Rowling introduced us to Newt Scamander and a handful of magical critters in the successful 2016 film Fantastic Beasts and Where to Find Them. Now, we return to the wizarding world in the first of four sequels, Fantastic Beasts: The Crimes of Grindelwald. 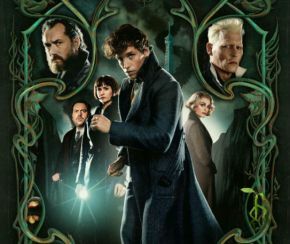 Written by J.K. Rowling and directed by David Yates, The Crimes of Grindelwald sees Albus Dumbledore enlist the help of Newt Scamander in an effort to thwart the plans of recently escaped Gellert Grindelwald in Paris. The danger amplifies as lines are drawn as the world slowly becomes more divided. Eddie Redmayne returns as magizoologist Newt Scamander and once again knocks it out of the park. He’s softly spoken but kind and relatable. His interactions with the magical beasts is still impressive and expertly handled. He has some good scenes with Callum Turner as Newt’s older brother Theseus and old school friend Leta Lestrange, played by Zoё Kravitz. Eddie is perfect as Newt and makes for a great lead to continue the series. Also returning as auror Tina Goldstein is Katherine Waterston. She’s still a good character and played well. She doesn’t quite have the same kind of role as the first movie, which saw her as a major part of the story, but it’s great to see her back. Everyone’s favourite no-maj/muggle, Jacob, is back alongside mind-reading Queenie. Played by Dan Fogler and Alison Sudol, they have a great on-screen chemistry and both actors do an amazing job, although it would be nice to see more of them together in this film, but with such a stuffed movie, it’s not hard to understand why we don’t. After seven long years, we finally get to see Dumbledore once again, this time played by Jude Law as a much younger defence against the dark arts professor. He does a fantastic job and is easily one of the best parts of the film, it’s just a shame he isn’t in that much of the film, with most of his scenes taking place at Hogwarts. Hopefully we will see much more in the future. After being outed as Johnny Depp, Grindelwald is given a proper role in this movie, starting with an imaginative breakout before heading to Paris to gather more followers. Johnny Depp does a great job as the evil wizard, but there isn’t much threat from him. Considering he’s the big bad of the series, he doesn’t have the presence of Voldemort. Miraculously, we see the return of Ezra Miller as Credence Barebone as he attempts to find out who his family really is. He’s still an interesting character and gets some good scenes, most of which he shares with co-star Claudia Kim aka Voldemort’s slithery friend, Nagini. Just like the first film, the highlights usually involve the imaginative magical creatures. There’s a ton of new creatures never before seen in the Wizarding World, including the scene stealing Zouwu (a cross between a lion and a Chinese New Year dragon), plus the return of Dougal the Niffler and Pickett the Bowtruckle. The story that nits all of the characters together is intricately woven and managing to find a good balance between them. The complex plot is unravelled well with a fine pace. The biggest issue is one that has got in the way of many movie sequels, and that’s the franchise itself. This is the second of a five-part story arc that focuses on Dumbledore and Grindelwald, and while this does have an important place within that arc, the story spends most of its time setting up what’s to come, rather than telling one condensed story with a few plot threads that the sequels can pick up. The first movie really raised the bar in terms of scale for the effects, this one does the exact same. The attention to detail is astonishing, filling each frame with so much magic that it deserves some investigating. Each creature and environment feels real, providing a proper glimpse into J. K.’s imagination. Just like the past films, this is jam packed with action and humour. All of the action set pieces are thrilling and make good use of each characters powers, while the humour manages to lighten the movie up and genuinely provides some brilliant laughs. On top of that, this being the first movie under the “Wizarding World” banner, it manages to find some great ways of referencing the Harry Potter series with Easter eggs and namedrops. The only problem is that some feel a little forced or just there for the sake of it. It would have benefitted more from a more secretive marketing campaign. The score was produced once again by James Newton Howard, who manages to adapt his already brilliant theme into something similar but different. There’s the odd note from the first film and a few trickles of the iconic Hedwig’s Theme from John Williams which provides a great sense of nostalgia and familiarity. It’s a gorgeous soundtrack that contains some haunting moments, particularly whenever Grindelwald is on screen. Overall, this is a spectacular looking movie with a story that begs for repeated viewings. It is by far the most mature movie to date. There are some truly (excuse the pun) magical moments, but it doesn’t feel complete and attempts to do too much. It’s a good movie, but unfortunately not fantastic. Purple Revolver rating: 3.5/5. A good second chapter.